It was a madhouse. At times we felt like an island of reason in a sea of insanity. The squirrels said it best. Not the worst we have seen and certainly not the worst we have been outnumbered but for those new to the environments in which we operate, deep in the heart of enemy territory, it was an eye opener. We got to the main gate of Hofstra University just before 1pm and Code Pink was already on the southeast corner which was the only corner on which people were allowed to stand. We set up right next to them and commanded an equal stretch of sidewalk. Where they had flags, banners, bongo drums and their ‘Mary Poppins’ pink umbrellas, we had flags and large plywood signs “Remember 911”, “Peace through Strength”, “Live Free or Die!” and “Pro-America, Troops, Their Mission”. The Turnpike at that location is three lanes wide in each direction with a center grassy median. The first two lanes were blocked off so that traffic had only a single lane. When we first arrived we positioned our signs diagonally from the curb to the traffic lane spaced about ten feet apart so oncoming traffic could read each in turn. We got a lot of thumbs up and honks from motorists during that stage. Later the police said that everyone had to be on the sidewalk so we moved back. We abided by the rules. Code Pink, of course, believes that rules are for everyone else but themselves. So they continued to press the boundaries to get an advantage. One woman danced across the turnpike several times to the bongo music while spinning her pink Mary Poppins umbrella. It came to a peak when two old Pinkos moved directly in front of us with one of their big pink banners. At that point I marched our into the street and talked to the officer in charge telling him in no uncertain terms that if those people weren’t removed from the street then we were coming out and there would be no stopping us. The officers quickly cleared them out and generally enforced their own rules after that incident. We were joined from time to time by a number of people from OIF Veterans, Veterans for Freedom, Hofstra University students, passersby, tourists, McCain supporters, etc… One older Hispanic woman sticks in my mind because she was so happy to see us and joined us right on the front line waving one of our flags and chanting along like the true Eagle she was! Having ‘discussions’ with moonbats is generally counterproductive and I try to avoid them for the most part. I watched one woman and her husband arguing with about ten folks all at once. All to no avail. Later I got sucked into one myself for a bit but broke off when it became obvious that nothing I said was penetrating. About that time I became aware of one young woman who was absolutely fearless. College kid, probably freshman or sophomore year, she would wade into the opposition arguing with them until she was completely surrounded and keep going like there was no tomorrow. Not just with other women, but with guys who looked like they could have been the next closest thing to crack heads, Another mother and her high school senior daughter were also fearless in their defense of their beliefs. All this time Obama supporters kept swarming into the area increasing the general size of the population. We were surrounded on either side and had another twenty or more to our rear. I want to make an important distinction. The Obama supporters were much different from the moonbats. While I may disagree with their choice of presidential candidate and their refusal to consider any argument against him, they also saw the humor in what we were doing to the moonbats and they were more likely to be laughing with us than scowling like the lefties. This pissed the moonbats off even worse than usual. At 6pm things got busy. We had some more folks arrive and at the same time the IVAW group (which only had about 8-10 actual IVAW) came marching up the southside sidewalk from the West. The crowd that was marching was about 300 people. They had to march in the street past us and some catcalling took place. They continued to march to the east but about a hundred or so of the La Raza and ANSWER coalition merged into the Code Pink corner and started some serious chanting which we promptly began co-opting. There were some really really upset people in their crowd who put their all into chanting with their bullhorns trying to drown us out. We didn’t have any amplification so it was our raw voices which is why most of us walked away hoarse. I used the terrain to the best of my ability by standing on a low stone wall that ran alongside the sidewalk and using a small cone type speaker (unpowered) to project my voice as loudly as possible. It certainly helped. The venom in the looks those folks threw me when we started screaming “End the Occupation, Russia out of Georgia!” or “Commies out of Hofstra” was priceless. The real kicker was when we would add our own chorus of “Deport Them All TONIGHT’ to the end of one of their chants. The police were trying to keep from laughing out loud, the Obama supporters were hysterical and the La Raza folks were livid! We actually could have played a little more on the divide between La Raza and the black community but I decided not to let things get too emotional. The Obama supporters also liked when I broke into the La Raza one about no police raids with “No Cucarachas, No RAID!” (No Cockroaches, No RAID!). I guess they could identify with it. About 7pm IVAW came marching back up the avenue and they all gathered in California Ave before marching straight across the Turnpike to the gate to the North Campus. The Nassau County Police had already stationed about eight mounted officers in line abreast across that gate and there was a standoff until the police led about ten to fifteen of the protesters under arrest to a bus. Then the mounted officers started wallking forward and forced the crowd back across the avenue. A few of the protesters were injured, one fairly seriously, while they were being herded. No skin of my back. I was only sad to see the police bus pull away three quarters empty. There were a lot more that should have been arrested. Meanwhile, the moonbat crowd kept trying to encroach on our space. We held firm and they were forced back to the original boundary. We were joined by small numbers of OIF Vets, Hofstra Students and McCain supporters all during this period. The Code Pink guy with the floppy hat who always travels with Suzy Banjamin was constantly walking up and down the sidewalk stirring up the Obama supporters with cries of OBAMA! The fact is that he could care less if Obama or anyone else gets elected. I didn’t see Suzy, and I suspect she had infiltrated the debate. About 10pm the crowd had died down when a regular bus stopped in front of us and five young ladies climbed off with their luggage! All Patriots, one wearing a Sarah Palin 08 footbal t-shirt, they had flown into JFK out of Oklahoma and came to do whatever they could at the debate site! They joined with us and we made arrangements for one of our guys to drive them to their hotel when we were all done so they wouldn’t have to take a bus, train and subway to get there! It was a long day of excitement, surprises and patriotism. 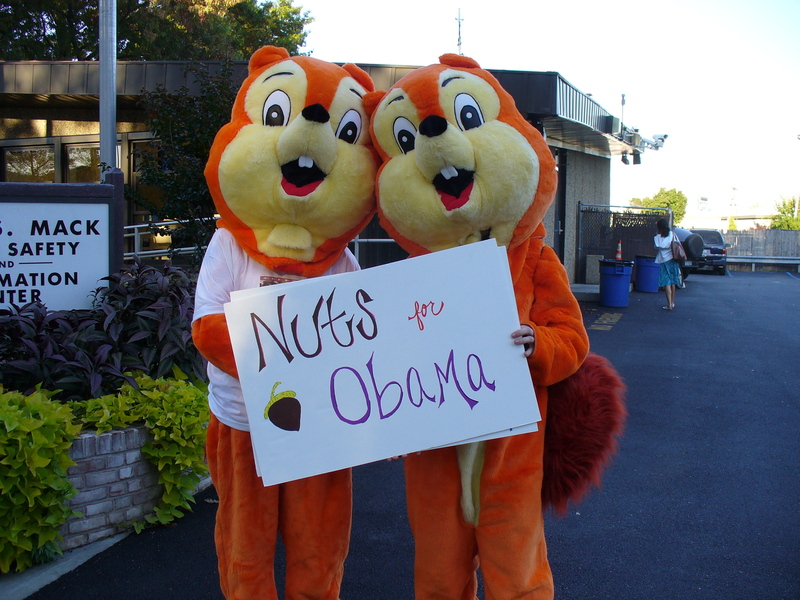 Two people came in big chipmunk costumes with a sign “Nuts for Obama” which was hysterical on several levels. They were not part of our group, but they did an excellent job. I already mentioned the one fearless girl. Another mother and her high school daughter were also in the same vein. Not backing down and not being intimidated. Medea Benjamin had to have been there, but she was not at the corner with Code Pink, The hat guy (the LA Hairdresser) was there and he always travels with her. My best guess is that she infiltrated the debate. I passed that suspicion on to the police. One policeman in particular went out of his way to come over and thank us for being there and for everything we do. Talking with two of the local lefties we usually see at the mall tour protests and them confessing that they don’t like Obama either! Priceless! I didn’t see Cynthia McKinney although there was one guy walking up the sidewalk saying he was a Green and that we didn’t live in a democracy because the fringe (my term) candidates weren’t invited to debate. He didn’t last long. We had a lone 911 ‘troofer’ trying to argue with us about the ‘conspiracy’. He was pretty persistent while he lasted. He disappeared by about 6pm. Watching the owner of the Dunkin Donuts scream at the Code Pinkos to move their pink RV out of their parking lot!